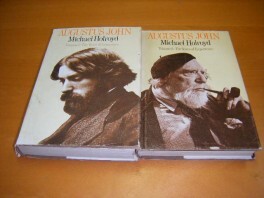 > Overig>Bijzondere collectie>Augustus John. A Biography. I. The Years of Innocence. II. The Years of Experience. Augustus John. A Biography. I. The Years of Innocence. II. The Years of Experience. 1974/1975. clothbound in dustjacket; 415 + 263 pp., set of two books in English (only for sale as set); in good condition: stamp on French title page in both volumes; wear on dustjackets.